A harmonious setting combining elegance and comfort, with a view of Lake Guéry and surrounding volcanoes: what better way to find rest and serenity after a day of skiing or hiking? Our wellness area is open to guests of the hotel and our health club. 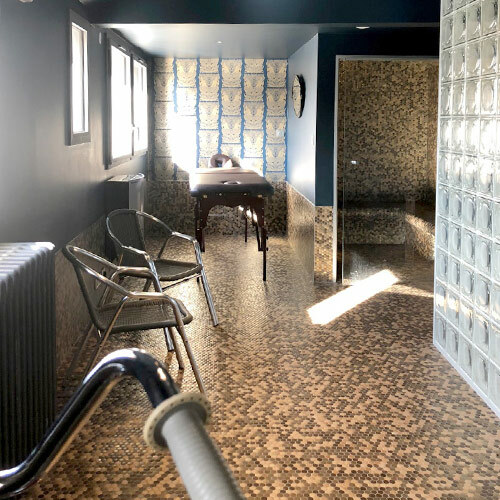 This space dedicated to letting go and well-being is composed of a hammam, for lovers of oriental relaxation, in a humid atmosphere with essential oils, a Finnish sauna to chase muscle fatigue and toxins accumulated during exercise, a rain shower and a relaxation area. This space is open on request at the reception. This space is strongly discouraged for pregnant women and heart patients.